Windows 8 has been in the hands of consumers for about a week now and we're just now beginning to get reports about the new OS's foibles from real users. I upgraded my Win7 PC to Win8 a couple of days ago and have been noticing that Metro Apps don’t completely communicate with traditional Windows applications. The extent of this ‘feature’ just became obvious when I opened my ‘old Windows Kindle application’ on the traditional desktop and had all of my downloaded books. BUT when I opened the ‘new Metro Kindle app’, while I was automatically logged into my Kindle account, I did not have any downloaded books. I went and checked my Amazon Kindle account page and sure enough I now have TWO separate Kindle accounts assigned to the same PC. I suggest you point this feature out to people. That's going to present some interesting problems for anyone who upgrades, isn't it? I was half expecting for the new app to replace the old one, not install alongside. Since it didn't anyone who is currently using the Windows 7 app will need to keep the existing app after they upgrade, Otherwise they'll need to download all their ebooks again. But that is not entirely the fault of Microsoft. Amazon is very picky on how they handle DRM, so much so that if you uninstall and reinstall the Kindle app on Windows 7 you will need to redownload all your kindle ebooks. The newly downloaded app won't be able to read any of the ebooks downloaded with the previous app (weird, I know, but true). I don’t think this is anything new. Since Windows 8 is a different OS, the app on the OS would be recognized as a different device (not a different account, I think the original poster misspoke.) The same thing would happen if you loaded the same Kindle app on the same computer running both Ubuntu and Windows 7. Each would be seen as a different device and books already downloaded on Windows 7 would not be seen by the app on Ubuntu even though they might be sharing the same partition for storage. Downloading the books again takes a ridiculously short amount of time, so for me, at least, as one with lots of devices, it’s never been a problem and when you do the last place read is always remembered, anyway. The quoted behavior is standard on Android, too. And since Windows is a multi-user OS each user gets a separate datastore and each user’s Kindle (or Nook or Kobo) app would appear to the authentication systems as a separate install/device. This has nothing to do with the OS. It’s how the Kindle app tracks content you’ve downloaded. The title is misleading as this particular “quirk” lies with Amazon, not Microsoft. Except that there are users reporting the same issue with IE and Evernote. This is a detail about the OS which I had not heard before, and that makes it newsworthy. Happened to me with Evernote. Two versions of the same thing. I uninstalled the app and pinned the original to the Start menu, which is what the Metro thing can be, if you configure it that way. Strangely, I’m not missing touch capability yet. And I do like the improvements under the hood. It’s faster and more economical. Smoley: Actually, it reads as more of a quirk in Windows 8 where the RT ecosystem is being viewed as completely separate from the “classic desktop” ecosystem. If Amazon had to design the app this way, it merely emphasizes the divided nature of Windows 8. Exactly so. Early reviews of Surface pointed out that photos deleted in the Metro app wound up undeleted in the Desktop’s Recycle Bin, where people had to go to actually delete them! Except that this isn’t an RT issue per se because the user upgraded their PC, not their arm-based tablet. 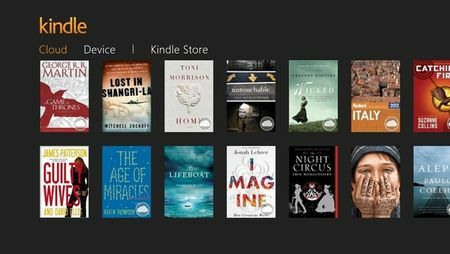 I’ve been using Windows 8 and the new Kindle App since sunday and I’ve encountered no problems with it. I rather like the OS itself, especially compared to previous versions of Windows, and I’m a Linux fanboy. It certainly is a lot faster. Key thing is: In Windows 8 (but not RT) there’re two kinds of apps – the old style desktop .exe apps and new Modern UI apps. RT gets only the latter. Those new Modern UI apps (downloadable from MS app store) are essentially HTML5 web applications running in isolated sandboxes. Their possibility of interacting one with another is very limited, and I do believe they cannot interact with ‘old’ desktop apps at all – hence the observed behavior. They can interact to an extent. For example, I could download a file with a Desktop App web browser, click on it at the bottom of the screen, and open it with a Modern UI app. I could download an ascm file, for example, with Chrome running in the desktop and open it with the Windows Overdrive app (which will download an Adobe DRMed Epub). After downloading 6 books I got a message that my disk is full, which wasn’t the case. No explanation from Amazon yet. Yes, I am getting the same error message, but ive only managed to download the one book so far! I am having this problem as well, any of you find a solution yet? I have Windows 8 Pro and am running the Non-App Kindle-For-PC Software. simply open your standard browser visiting the books page on amazon. (which is chrome on my end) but always the Microsoft Internet Explore. So whats the problem: Currently, pressing the purchase button gets me nowhere. Windows 8 is looking for an App to open the internet page (or Metro Page? How can know). I could care less for Metro really, or it’s applications. I want kindle for pc to use my default browser. Period. Its the first kindle app that dont seem to support non-amazon books. Not even ones uploaded to amazon as “personal documents”. Only books bought at the kindle store. It rules out most of Europe. I need my Kindle books stored NOT on C: but elsewhere. Is there a way to set this up on Windows 8? If not, could I copy the books from a USB to where I want them and then click on the file to open them in the Kindle reader? There are even more problems with the Windows8 Kindle app. Many users, myself included, have been getting error messages that the “disk is full” when only 3 or so books have been downloaded and there are 100s of GB storage free on the HDs. There is extensive and angry discussion of this problem on the Amazon support forums (http://www.amazon.com/gp/help/customer/forums/kindleqna/ref=cm_cd_pg_pg4?ie=UTF8&cdForum=Fx1GLDPZMNR1X53&cdPage=4&cdThread=TxCSVNEBX1YSPY). This really seems poor quality control from Amazon. I have a problem with Kindle on my Win 8 as well. It does not want to open after i type in the username and pass, it only shows on screen loading and after a while it just goes to tray. Does anybody know what could be a problem? You do know that you can import the books from one device to another, right? So that you can have all of your books on all devices. This does not work for personal documents though. Personal documents can only be seen and opened on your actual kindle device and not the apps. Unless the file is on your computer, then you can drag and drop.